Today I attended the EdCampDenver session at KCAA. The level of enthusiasm reminded me of why I entered the teaching profession. For some crazy reason, people are under the impression that principals are supposed to know everything when they enter a classroom, school, or district meeting. It is the typical old–school mentality, and we need to start looking at it entirely differently. For example, when I hear about the successes of Google, I don’t automatically think of the CEO, I think about the culture they have created in their organization. In the EdCamp Google Plus Session facilitated by +Ben Wilkoff, I heard from some very talented individuals that love what they do, but some expressed frustration because they could not move as quickly with technology as they wanted to because the roadblocks we cause at district and school levels. As everyone shared what they needed from their schools, I reflected on the supports I need to continue to provide for my teachers so they don’t feel the same frustrations. Principals, educational leaders, teacher leaders, parents, policy makers, and district decision makers need to get out and be part of the change that is happening around them opposed to be the change they are trying to create. Develop structures – As we begin the process of blending technology into the fabric of our instruction, we need to set up a simple structure for teachers to easily implement in the classroom. Today I was educating myself on Google Plus. As I was listening, I heard a few educators state there are too many choices of programs to use. My take-away is to set up a simple structure and model for my teachers. I plan on looking into sending out my weekly bulletin on Google Plus. Before I overwhelm my staff, I know I need to set up a structure, create a community, and keep it simple. Maybe I will do a video communicator! What do you think, +Ben Wilkoff? Model the use of technology – We might be experts in instruction and analyzing data, but we can’t expect to keep up with the technology. Many of my teachers have surpassed my knowledge level in the use of technology. It surprises me that I don’t see more principals at the technology meetings. As principals, we need to make ourselves vulnerable in our learning and model what we expect our teachers to do for the kids. In the EdCamp Session – Google Scripts, facilitated by +Nate Ubowski, I learned about Doctopus Scripts. Now instead of sending an email, I can send a document and ask them to complete it. I also learned about Goobric. Guess what I am going to do? Send them a document and then give them immediate feedback from the rubric. Do you think I might get some teachers to check out the two Apps? Lastly, if you don’t have the expertise, then just move out of the way, provide the supports, and of course, ask the right questions. Allow teacher to take risks – In both EdCamp Sessions, I attended I heard several individuals say they are 50/50 on the use of technology in the building. This is frightening, because I definitely want my own kids and students to be in the 50% that are using the technology. 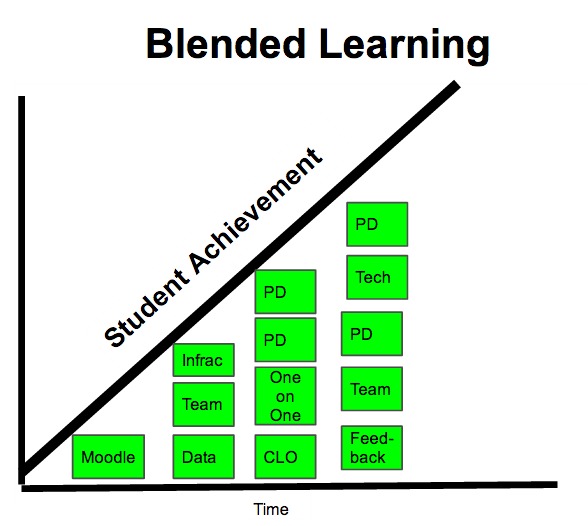 Last year, as we were creating our blended learning plan, I was referencing the graph below to the teachers. I kept reassuring them that it does not matter where you are, but that we ALL are on board in using the technology in our building. This became the point where the changes started to happen. Support your teachers – As principals, we are closer to the front lines and have a pulse of what is going on in the classrooms. This goes back to the graph that we need to start from where they are at and move forward. Let’s not wait for colleges to send us teachers already trained in technology. Let’s provide the supports for our teachers to utilize the technology effectively. As one teacher at EdCampDenver stated, “The demands are high and if you don’t adapt to technology, you cannot do your job.” We need to use technology to help do our job.” I couldn’t agree more so let’s make it happen. Previous What is Blended Learning at our school? I've said it before, and I'm happy to say it again. Sometimes the most important thing I can do as a teacher is get out of the way. It was great to see you again today! Thanks for coming, and thanks for supporting your team. They're lucky to have you. Brainstorming with you here, but maybe the next iteration of your dream and vision lies inside the intangible pieces and elements of an empowered learner and teacher. What if there actually is even more you can control as the technology and pace of change continues to speed up? What if your guidance in regards to the physical spaces of inquiry, reflection, and sharing are the underdeveloped element of equipping your learners with rocket fuel and inspiration? I am thinking about what your learners need to ask big questions, take risks with their ideas, feel safe, and feel connected to something bigger. Small tweaks of your environment both inside and outside the classroom, may unlock even more buckets of awesome. You are a visionary and leader for all of us in regards to leveraging technology for your staff and children. I am excited to see what you do next! Thank you for your very valuable comments. I enjoyed seeing a principal who was as excited about #edcampdenver as all the other people st this event. It was great to see district personal, teachers, principals and other positions all having great conversations and so passionate about learning. I would like to thank you for your comments, thoughts, and the courage to break the mold of the classic principal of giving top down orders but actually working to change education from the bottom up by increasing your knowledge and skills. I am so excited that you got this much out of #EdCampDenver. I definitely think communicating through video is a great way of putting yourself out there and modeling for your staff what is possible. Please let me know if you want to think that through, though. Your emphasis on communication and simplicity is the right one, and I think it will go a long way to not overwhelming teachers (and students, in the long run).